Le Blog de Frivole: Holidays! Time is flying! Seems like ages since I last posted. I've been away to visit my family which was wonderful. I'm now back but it's so close to Christmas and so much to do! I'm sure many of you feel the same. I've not been tatting much after the flurry of Qaniks. I have been giving them away to friends and family to put on their trees. Instead I've been knitting presents! 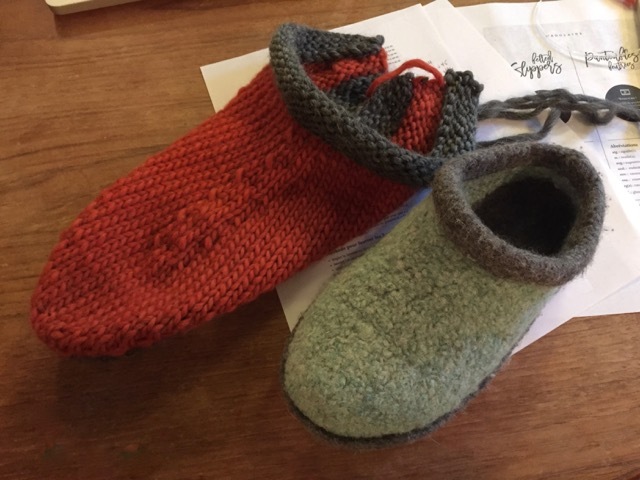 I made two pairs of socks for my father and then whilst home, discovered this great pattern for knitted felted slippers. I just had to give them a try. 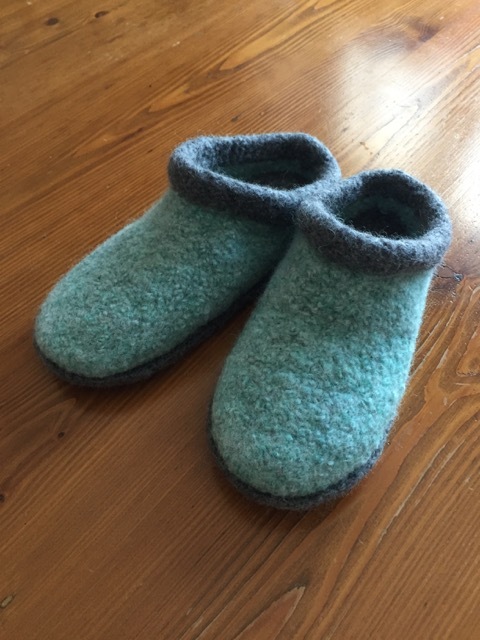 They have a great shape and are so comfortable to wear. A real winner! This was my first pair, to see how they worked out. before they came out right. which have gone in the post this afternoon. She said she liked burnt orange and grey. I added some decorative buttons. I'm quite behind with everything (that's what happens when you go away at the beginning of December!) so tonight is Christmas pudding making... and more knitting! I hope you are all enjoying the build-up to the festivities but also having time to relax and spend time with friends and family. 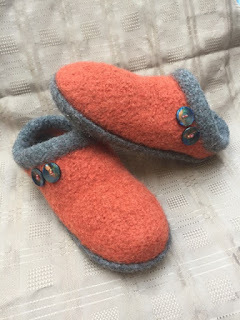 Splendid felted slippers, they’ll make wonderful gifts. Aber die Pantoffel gefallen mir gut. Hi Sylvie, I did wonder where your message went! It came up in my emails but when I went to answer it, it wasn't on the blog. Luckily, this pattern is available online. It's from a small wool shop in my home town so the site is in French but I think the pattern is available in both french and english. The site is madolaine.com, look for "tutoriels". A great pattern I highly recommend! Thanks so much! Actually I'm French so I use patterns in French or English (whatever the craft ^_^). I always post comments in English because it is more simple that way - accessible to most readers. This pattern has been downloaded and duly saved in my files; it's nice to find patterns from various countries; I do think this is my first one from Quebec! What a great gift. I love your slippers.